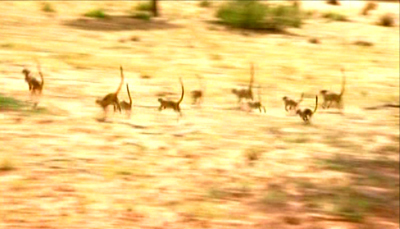 This is a reality TV program about meerkats. It is totally engrossing. 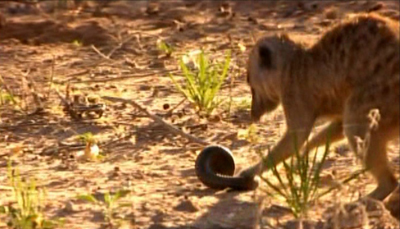 There is more melodrama packed into one day of this large family of mongoose relatives living in the Kalahari Desert than you’ll find on most human shows in a month. Every 24 hours some disaster befalls this clan, and 24-hour cameras record everything. A brave son suffers a lethal snake bite, then stupid teenage baby-sitters go off to play and forget the baby who dies in the heat, a psycho uncle puts the colony in danger, a sad betrayal by a brother-in-law, a rebellious daughter gets pregnant via a male from the enemy clan, a powerful mother plans infanticide, and nasty one-eyed leader from a rival tribe tries to take over — all that is just the first week! This long running series has become a huge international hit. There are tons of online forums, discussion boards and YouTube clips interpreting the complicated relationships of these cuddly mammals. The small size of the meerkats speeds up the cycle of their lives, and their open desert home makes filming easy. Plus they stand on two feet — instant film stars! In addition meerkats are weirdly social animals (the dominant female prevents other females from having families) which makes the saga of their intertwining lives endlessly fascinating. With 52 episodes now filmed, the series is quite addictive. Unscripted, the shows are constantly surprising. You can never guess what will happen next on this super-charged reality show. Will the wayward daughter live or die? Will her mom kill her children in anger? Will the hated brother break up the clan? 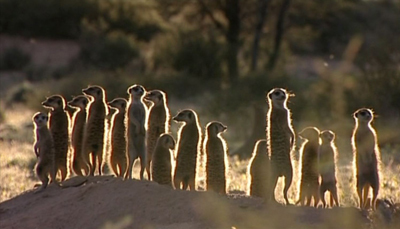 Meerkat Manor provides the same gossip-fodder as a human soap opera, except it’s far more extreme in its plot turns. It’s a soap opera on steroids. Best of all Meerkat Manor is a supreme piece of natural history — the cameras and longitudinal study is based the Oxford-sponsored Kalahari Meerkat Project‘s 10-year observation of these colonies. This series is an intense short course in mammal behavior. Hard not to get hooked. Love my Meerkats and yes I’ve heard there is season five. I’ve seen these precious animals in Sydney, New York (Staten Island), Miami Metro zoo, Washington D.C. and San Fransico. My daughter brought back a ceramic meerkat from Africa for me. So I guess you can say I love my Meerkats. Also, get the stuffed animal and all DVDs. Animal Planet US has made clear in e-mail responses to fans that they do not plan to air a fifth season. They were the main financial backers of MM, and so Oxford Scientific films has not resumed filming. The fourth season was filmed from August-February 2008 and is now far out of date, even though it has only recently aired in some countries. So at the moment, there is no season 5. There is a petition on the care2 network to bring back the show. I have contacted Animal Planet about bringing back the meerkats and the representative I spoke with was not very positive. She indicated that they may not be bringing back Meerkat Manor. Instead of bringing back Meerkat Manor they were going to be running something else in its place. I love Meerkat Manor and just hope we have a season five. Wrote Animal Planet and they sent me an e-mail back that they are not sure if there will be a season five. I did mention in my e-mail to them that we felt the PR was not very good last year. The years before there were many advertisements on T.V. and even bill boards I saw in New York. I have no idea what happened. I think this is the best show on Animal Planet and the way it has been produced (like the Sopranos)along with the music, and writing made this a hit. Any news on season 5 yet? Its spring 2009 and not a word..please.. I really wish they would bring back the show! I am sad Rcoket dog got run over by a farmers car but at least Sophie has her chance at the top. I wounder who the new dominant male is though….. some one tell me! 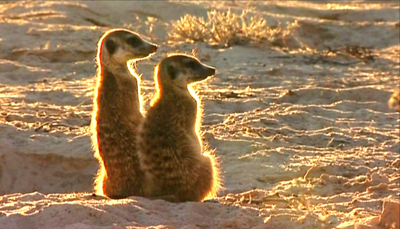 Both Sean & Stockard are fine, but it is the meerkats who are the real stars. They brighten our lives and I miss them very much. On days when I don’t have to work (I’m semi-retired) I plan my day to make sure I’m here at 2pm to Watch Meerkat Manor. Today I turned on my TV and Meerkat Manor is GONE! I scanned through the next few days of the Guide and I don’t see it anywhere at any time. I’m willing to be part of a mass e-mail to Animal Planet to restore Meerkat Manor to it’s daily schedule; just tell me where to sign up. Animal Planet has added some really good programs lately (Killing for a Living and Monsters inside Me, for instance), but MM is the one that gets me sucked into the station for the day. I hope there are enough of us who feel that way to prevail on the producers of the network to restore our favorite. Sir, You are wrong about the producers not reading it. They are not currently filming in the Kalahari, but do not give up hope. Time will tell! Okay, from what I have previously read, I have gleaned that there will be a delayed season five. However, it will not be shown in the US, so we have to wait for the DVD! Yes? Will someone from Animal Planet weigh in on this? For all the previously-mentioned reasons (plus more) given by others, I too am a Meerkat Manor addict. These little animals have an indomitable spirit for life that is amazingly almost human. This show has also been my favorite for the last few years, and I and others are going through MM withdrawal. I have all the DVDs, but I would like some fresh plots to be entertained by. For any producers reading this–please remember your starving audience members. Even the very cute orangutans on their show cannot begin to compare with meerkats. For all the Meerkat Manor fans breathless waiting a response from Animal Planet producers I hate to break it to you but this site, True Films, has nothing to do with Animal Planet, or Discovery, or DVDs, or Meerkat Manor. True Films is a site where I, Kevin Kelly, review my favorite documentaries. 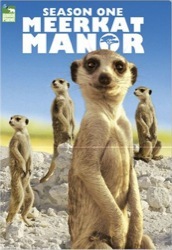 Meerkat Manor is one of 250 documentaries I have reviewed. I have no idea why fans of the program are posting their requests here. I am tickled by the enthusiasm for this show, but I just want to make clear so you will not be disappointed: you guys are the only one reading this. The producers are not reading it. No one from Meerkat Manor is reading this review site. I know from experience that my statement here will not stop people from posting their pleas, but there you go. Ugh, i really HOPE that the new season comes to AP or at least it will come soon on DVD! somthing else? like wat? n i heard that Thundercat n Ella(A.K.A. sophie/or Mango) became the new dominants of the Whiskers after Rocketdog got run over by a farmers car! It was going over the speedlimit! Shame on u farmer! but thnxs to that The Whiskers got a new dominant male! N Maybelines stuck with Zaphod n is partnerless! yaaaaaaaaaaaay! ive never liked Maybeline! We need a petition or some way to show ppl (And beg…) that there is definitely an audience for meerkat manor season five. Why would they cancel it? I NEED to know what happens!!!!! I’ve rewatched seasons 1-4 many times along with the movie at least four times and watch it on animal planet when it comes on sometimes. This show has to come back, I love it need it miss it and want it!!! MeerKat Manor was one of the few programs I watched. When is season 5 coming to TV? I live in a nursing home & animal planet showing meercats was one big thing here, isnt there a way to contact the producers???? CHawkins is the creator and executive producer of Meerkat Manor! CHawkins did not leave that message here on this blog. You read it somewhere else. Animal Planet needs to bring Sean Astin back with Season 5. Stockard Channing was okay but she sounded a little fufu-ish for this type of show. Sean had a heavier deepers voice that caught your attention and made you want to listen to what he had to say. In her email to me after sending her the link to your review. She did indeed read it. I am part of the petition burrow. She has given us her blessing. Hope you will sign the petiton. Bring on all your friends…. @Catherine: You can post a link to your petition here, but be clear to all that this blog forum is not the petition. It is a place to discuss this incredible documentary. I Miss Meerkat Manor!! When will it be coming back? It’s a great show for all ages. You feel like your part of their family. Watching their everyday survival and their tender moments. Please bring it back soon!! I Miss My Meerkat Family. I too love watching Meerkat Manor. I started out watching it with my daughter when she was smaller, now I find myself at the TV before she gets there. These little fuzzballs really get to you. I’ve tried watching other type shows but all fail to compare to the Meerkats. Animal Planet – please don’t take this show off, it’s the only thing you have worth watching! If it goes, then I go too! Please, bring back Meerkat Manor!! I’ve been dieing to see the new series. Please!!! Oh, I miss the meerkats so much. Any word on new programs for 2009? Please bring them back. and want meerkat manor to come back on. so please bring them back!! ps. MEERKAT MANOR is awesome!!!! How – and from whom – did you hear that there would be a season 5? Can you e-mail me at: kgeary5@cox.net? I have been wondering why I couldnt find Meerkat Manor anymore. I really miss that show. It was my one of my all time favorites. even my brother in florida always watched it. very disappointing. I miss them too and hope they will be back. I am wondering how the Whiskers are doing with Rocket Dog at the helm…would love to know what Zaphod, the venerable patriarch is up to, as well. Flower left quite a legacy! I am so disappointed that Animal Planet will not be showing a season 5 of Meerkat Manor here in the USA that I will no longer watch the channel nor will I buy any product previously advertised on the channel. I will advise my friends to do the same, including those who never had the chance to watch Meerkat Manor. So, is…was…there a Season 5 of Meerkat Manor or not? How did you hear that there will be a season 5? Do you know when? animal plant really needs to make sure that there will be a season 5 because meerkat manor is like the best show ever!!!!! dose anyone know when season 5 will be on dvd? if u do then answer me!! I’ve written 5 or 6 letters to Animal Planet and also on the petition burrow site. To be honest, I also e-mailed National Geographic if they would be interested. Do you know if the producers of Animal Planet are reading these comments given on the petition site? I tried to figure out why in the world they cancelled this wonderful and amazing show….what it seems to me is that someone new came into the picture of decision making. I just want it back and hopefully Sean would be our narrator. I’ve also wondered if people have e-mailed him. Keep contacting Animal Planet so we can get out meerkats back on. Have no idea what is wrong. Are they still filming and doing research in the Kalahari? Why was Sean let go? Animal Planet needs to realize how much this show means to all of us and to the meerkats that have benefited from the interest grown from this show. i dnont know when it comes to DVD but i want to know too. so some one please answer us!! meerkat manor was just beautiful,entertainmenting,and amazing.i think the people running animal planet just lost there mind in 2009 and even now? !like if you look at animal planet in the 90’s and 2000 thru 2008 it made you love nature and when i was a kid i loved animal planet and not much kids watch animal planet but now its like they just stabbed me in the back.it started when they change the logo to some crapy thing and then the shows they started going to jungel to a home in the u.s?! i dont want to see pets all the time just like on one or two shows. and then they made it about humans?!!! i dont want to see humans unless if its the crocodile hunter,jeff corwin or bugging with ruud but one of the worst thing they did and i meen this got me mad and it tacks a lot to get me mad but if look at the logo toda you well see under the animal planet ‘surprisingly human’?! i hope the guys who make this grap can read becouse human and animal they maybe the same and live on the same planet but you see humans on evey other chanel! well thats it i hop they well learn from the big mistakes.ps i stop watching animal planet. so get better.